A very silly card game. Eeek! There's a moose loose in the kitchen... and another in the bathroom! In this silly matching card game, the goal is to keep the moose out of your house, while giving them to your opponents at the same time. Use a door card to close off empty room or if you're lucky, plant a moose trap to keep those lovable but uninvited visitors away! The player with the fewest moose wins. 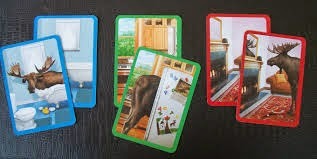 All players start the game with an invisible empty “house” in front of them and a hand of 4 cards. As the game progresses, players fill opponents’ houses with rooms and then those rooms with moose. On their turn a player will draw a card from the draw deck and then choose one of their cards to play. 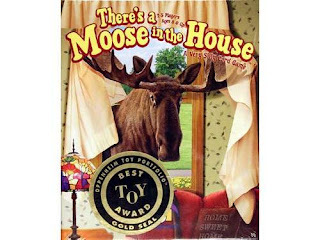 You might play a There’s a Moose in the House card on any opponent or play an empty room card on any opponent, or play a door card to close off an empty room. No matter which cards you play, this is a fun family game with silly looking cards.